CRAZY DISCOUNT! Was: $79.95 Now: $69.95! Puppies always are excited about every outing, especially going out by car. This dog car seat cover would make every trip with your pet easier, which keep your car clean. 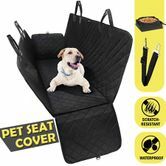 The seat cover protects the seat from the dog's claws, dog's hair, dog's drools and waste while getting in and out. The dog car hammock can be fixed firmly on the back seat by adjustable buckle straps and features non-slip bottom. It is easy to clean. Better still, it also comes with a foldable bowl for your pet to eat or drink. The cover folds easily to store and is suitable for SUV, van car, truck. I'm going to take my lovely dog called cola for a trip too. This Button Bowl which can be attached to the car seat cover. 44cm x 34cm x 6cm approx.